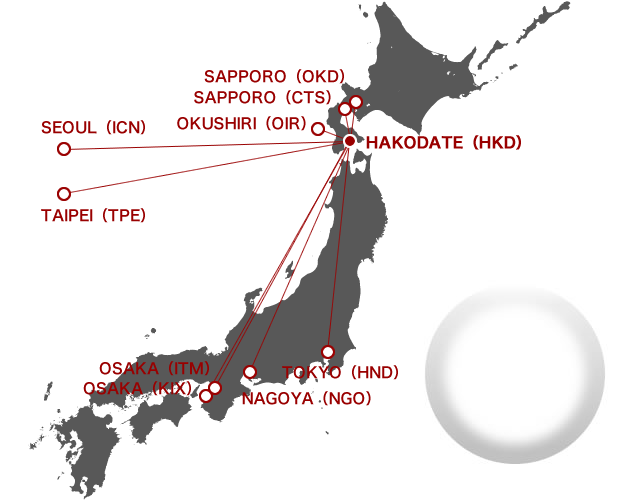 Hakodate is known for its conveniently accessible airport. Situated along the coast 10km from the city center, Hakodate Airport is a major gateway to southern Hokkaido handling the second largest number of flights in Hokkaido behind only New Chitose Airport in Sapporo. >>Hakodate Airport Terminal Building Co., Ltd.
Travel times reflect estimates only. On occasion roads in Hokkaido are closed or restrict access during the wintertime. Please confirm road conditions at the appropriate website prior to leaving.